Back on the boring conversation. 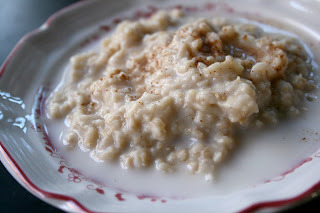 Another food that I eat a lot of is oatmeal. I put oatmeal in so many things. If there was one food that I could not live without...it would be my oats. I was asked by a friend of mine one time about how many servings of oats I have in a day. I would say probably 3 on a normal day...don't judge me! I have oatmeal for breakfast everyday. It makes me feel good and it starts my day off feeling very nourished and satisfied! The combinations for your morning oats are endless. I love seeing what other people do with theirs. I could never get bored with this stuff! I eat it for breakfast, I bake with it (pizza dough) and I have it for dessert! Preheat the oven to 350 degrees. Combine everything and pour into a oven safe bowl or baking dish sprayed with nonstick spray. Bake for 30 to 40 minutes. Serve with whatever topping you like! I love all your combo's! Oats are so universal! OK, I'm going to judge. Oats, carrots, oats, pumpkins, oats, apples, oats, oats, oats. Clearly, you, Ma'am, are a horse. Expect a designer feedbag for Christmas! 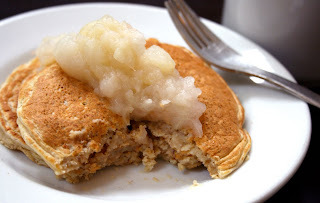 A homage to oatmeal! Love it. 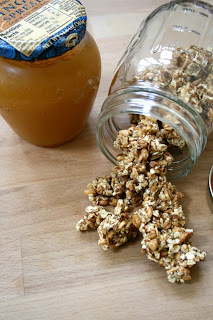 hi, i would love it if you would share your granola recipe with me! 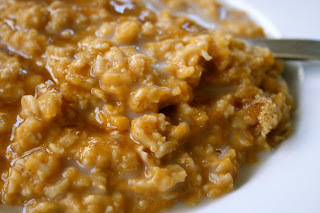 I love oatmeal too - and I'm so going to try your sweet potato version! Where did you get oatmeal ice cream? peeree, I would love that!!! anonymous, I will share it at some point. afectionknit, I came up with it. 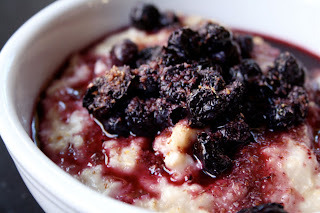 I love oatmeal and I wanted to play with it. It makes the ice cream stay creamy! 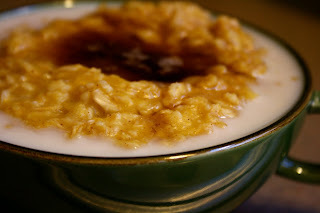 I love, love, love anything involving oatmeal!! Funny thing is, it used to make me gag when I was a kid, haha! Weird how my taste/texture preferences have changed so drastically. I could eat it any time of day like you said. 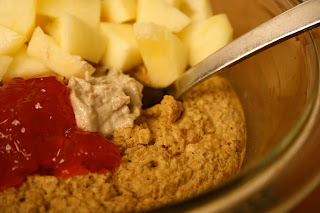 There are many evenings where all I want for dessert is a big bowl of oats topped with PB! I need to try putting SP in next! Oats are great, I really need to eat them more often. 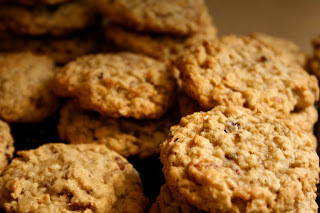 They're so good for you and I love all of your creative ways to eat them. Thanks for all the ideas!! 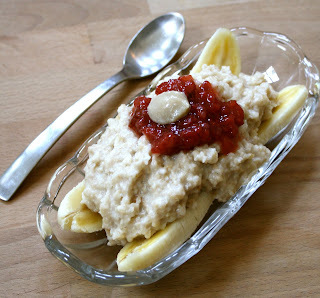 The oatmeal banana split is such a great idea!!! 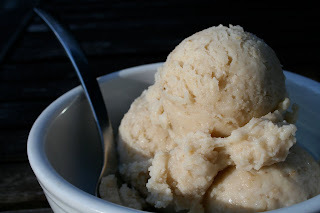 Lie to me, please, and tell me that oatmeal ice cream can be made, gluten, milk, wheat free. If you can tell me this lie, please post the recipe. Anonymous, the link to the oatmeal ice cream is under the picture. 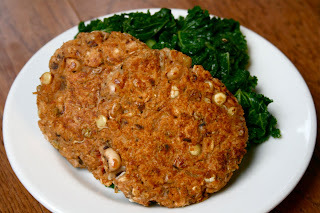 It is dairy, gluten and wheat free! Enjoy! OH wow...I love oatmeal! This entire post had me DROOLING!!! I just discovered your blog...and am an instant fan!! Yep, you're going in my feed reader the instant I'm done writing this. I will also be trying the oatgurt banana split, the oatmeal ice cream, and the baked oatmeal ASAP. Woohoo!